by Bob Chapman, 29 Jan 2017. 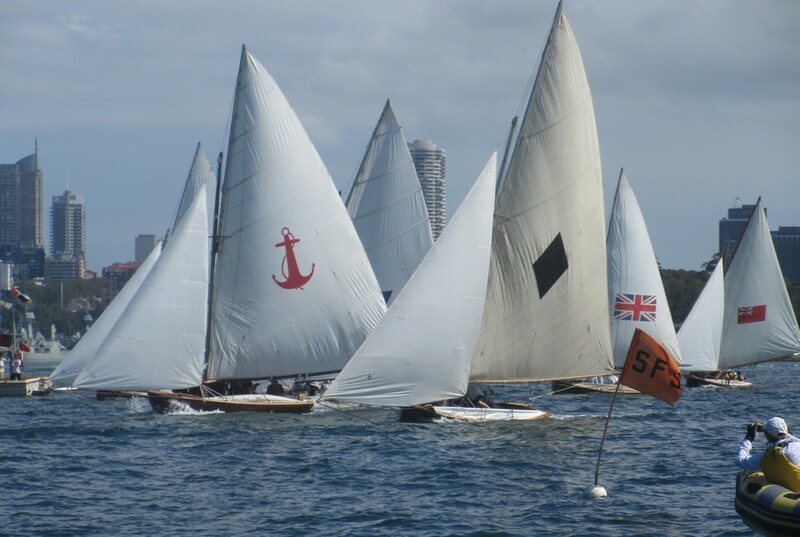 Race 15 of the 2016-17 Season and Race 2 of the Historic 18 Footer Australian Championship. A great sight to have all10 skiffs on the water together, albeit with a mixed bag of rig selections as some decided not to change up from the gear carried the previous day in the Australia Day Regatta. Being a week day the race started at 4.00 pm and without the usual Rosman Ferry to follow the action. The race got underway from a scratch start off Kurraba Point on the no.2 East course into a light easterly breeze and the beginning of a small run-in tide. The start line favoured the boat end with Myra Too off the line in prime position for the beat to Shark Island with Yendys and Aberdare to leeward. Yendys negotiated the light conditions best and worked their way into the lead to round Shark Island ahead of Aberdare and Myra Too, with all skiffs setting a port pole spinnaker for the long run back to Kirribilli. However, with 2 large cruise ships exiting the port, the skiffs were forced to sail a high course on port before gybing on to starboard to complete the run to Kirribilli. Alruth suffered a mishap in their gybe that resulted in the mast heel chock being dislodged and their mast coming down, fortunately no serious damage to man or boat. Yendys rounded the bottom mark with a clear lead over Aberdare for the beat to Clark Island. The tail-end skiffs were making slow progress in the fading breeze and the “shortened course” signal was applied when they rounded Clark Island indicating the next and final leg would be a run back to the finish at Kurraba Point. Yendys went on to win by 2 mins from Aberdare, then Myra Too, Australia IV, The Mistake, Tangalooma, Britannia, Scot and Australia. The AHSSA Rating result for the “Galloping Ghost” trophy went to Yendys, Aberdare, Myra Too, Tangalooma, The Mistake, Britannia, Australia IV, Scot and Australia. While the handicap result, for the “Raw Meat” trophy went to Yendys, Tangalooma, Myra Too, Australia IV, The Mistake, Aberdare, Britannia, Scot and Australia. With thanks to our on-water support team of Barley, Anna, Russel, Rob, Peter, Adrienne, JB, Bruce, Louise, Al, Eva, Chuck, Bill. The other highlight for the day was the post-race launch of Ian Smith’s book “The Open Boat – the Australian 18-Footer Origin, Evolution and Construction”.